A new year wipes the sales slate clean, and adds some new faces to the charts in the form of the Ford Fusion Energi and the Honda Accord PHEV. However, the first month of 2013 should have a large (*) asterisk beside it, as multiple supply issues seem to be plaguing just about all the major players not named Ford or Toyota. Affecting January’s dismal result was a extended shutdown in December over the holidays (Dec 13th to Jan 2nd), which seriously affected inventory levels entering this month. Illustrating the problem, in December GM sold 2,633 Chevy Volts, but only replenished 1,509. Next month’s result will likely return more to the norm (2,000+), as GM ramped up their Hamtramck facility production and churned out almost 3,000 units (2,949) to replace inventories for February. Sales PDF can be found here, production report here. Nissan LEAF: In January , Nissan sold 650 LEAFs, which was down 3.8 percent compared to January 2012. For the first time in awhile, Nissan’s monthly result does not reflect customer demand, as the company only had about 900 2012s LEAFs in inventory after moving 1,489 LEAFs in December. Don’t expect February to be significantly better, as the first 2013 LEAFs start to trickle out next week, with Nissan telling us that it will likely take well into March to fill the supply chain. Tesla Model S: Tesla does not give out exact monthly sales…but they do give a lot of updates, and consumers fanatically track their progress, so we can make a pretty accurate guess. In an effort to make reduced projections for 2012 sales (2,700-3,335), Tesla sent emails to almost all customers expecting product in January and even February, asking them to “move up” their paperwork to before year’s end to perhaps get their cars early…even if the cars didn’t arrive in December of 2012. Fisker Karma: Like Tesla, Fisker does not report monthly sales. However, that doesn’t really matter anymore, since the company hasn’t built anything since July, and it now being run by the Huron Consulting Group out of Chicago because they can’t control their own finances. After selling a little more than 2,000 Karmas to date, and losing 338 to Superstorm Sandy, Fisker was left with about 300 extended range luxury sedans to sell off worldwide. For the US, inventory dropped from around 140 to 120, and seeing how as they don’t build them anymore, we can use our amazing deductive powers to say that Fisker sold about 20 Karmas this month. Toyota Prius Plug-In: Despite being one of only 2 plug-in auto makers not feeling a supply issue of some kind, Toyota sold a less than expected 874 Prius plug-ins in January. In the previous month of December, Toyota had a relatively strong month, selling 1,361 PIPS. The Prius plug-in finished 2012 as the second best seller in the segment, with 12,750 units sold. Ford C-Max Energi:In January, Ford sold only 338 units of its plug-in C-Max Energi, as the entire C-Max brand of cars struggled in January. In December, Ford sold 971 units, down from 1,259 in November, but demand was not the issue either, this month or last, as Ford focus on getting the Fusion Energi to market this month. Ford entered January with less than 175 on dealership lots. The prior month of December was also pretty lackluster as 19 plug-ins were moved. The all-time high water mark for sales in a month was 26 in November. Looking ahead, the addition of the Accord PHEV to the Honda lineup, which went on sale on January 15th, may lend some credibility to the FIT EV program (and some new eyeballs) for February. However, without a major reduction in the lease price ($389), it is going to be even harder to compete against the likes of the 2013 Nissan LEAF, which now starts at $199/month with $1,999 due at signing. Ford Focus Electric:Down too are sales of the Focus Electric. In January, Ford sold just 81 of the electric version of the popular Focus. For December, the addition of the C-Max Energi (and a legion of new dealerships with the ability to sell plug-ins) over the past 2.5 months has certainly helped the Focus Electric, at least initially, as sales have gone from 30-50 per month in late summer, to close to 200 a month in the winter until this month. In December, Ford sold 167 units. Toyota RAV4 EV: Unlike with the Prius plug-in, Toyota has a bit of a problem getting people to buy its Tesla-sourced electric conversion of the RAV4. For January 25 all-electric SUVs were sold. Late in 2012, Toyota slashed the MSRP on the RAV4 EV by as much as $7,500 to spur sales, however the program was not that big of a success as Toyota ended up still only selling 52 RAV4 EVs in December before trailing off even further this month. Mitsubishi i-MiEV: Amazingly, in January 257 i-MiEVs were sold (their best result ever) thanks mostly to some heavy discounting (as low as a $69/month lease) . Mitsubishi’s best result last year was only 85 (which was sold in May of 2012), so this was a very significant month for the little Japanese EV. As the Fusion Energi starts trickling into dealerships this month, it basically offers the same package as the C-Max Energi but in a larger sedan package. Unlike the C-Max Energi, the Fusion Energi has been priced in-line (and above) the other 5 Fusion trim levels in the model lineup, so as not to ‘steal’ sales from itself. This has resulted in a starting MSRP of $39,495, which we feel is a bit steep. Honda Accord Plug-In: Even though Honda said their plug-in, extended range EV went on sale in January 15th, there really wasn’t any inventory, and only two were sold. Officially classed as the new year’s first ‘2014’ model, the Accord PHEV doesn’t come cheap, as Honda has recently priced the sedan at a very Fusion Energi-like $38,780, markedly higher than consumer expectation for the car. 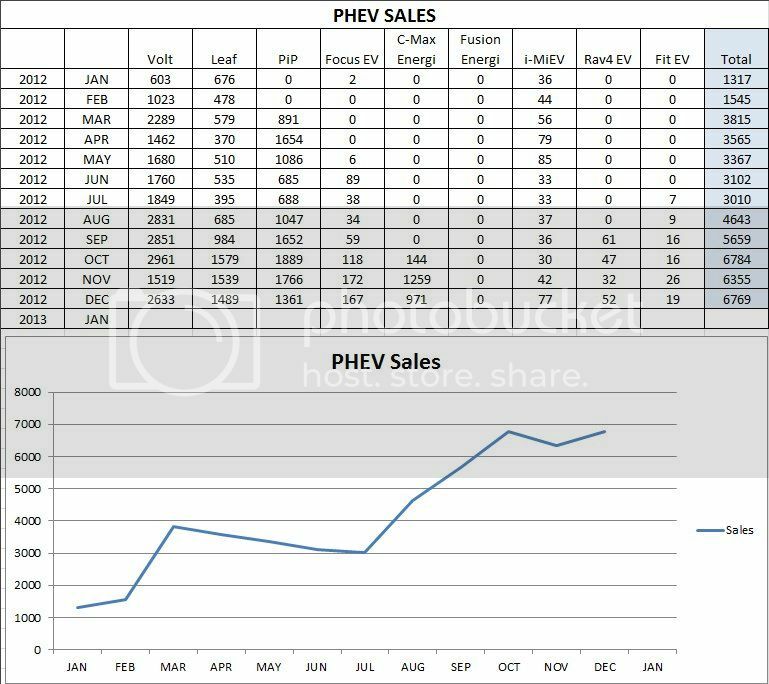 26 Comments on "January 2013 Plug-In Electric Vehicle Sales Report Card"
Inquiring minds want to know: why are other car makers slower to report their monthly sales? They are spiteful and they want to make my job unnecessarily difficult? I really don’t know. Its really only Ford that messes everything up (although Toyota is sometimes difficult to get in a timely manner as well). Auto sales are ‘supposed’ to all come out at 1pm, but GM has been jumping the gun the past couple years. We figure people what to know as it happens, rather than getting a recap next Monday, so we publish out the scorecard as soon as the the first numbers trickle in. Your fingers probably hurt after all of that typing James—but well said! I often think GM missed numerous opportunities too with the Volt in its early years. First, they could’ve/still could take a hit for the team with the MSRP. I mean $5000 less would’ve been a small price hit to absorb on a relatively small volume vehicle in the beginning. And the emotional shock of a high sticker price could’ve been diminished at say $35000 MSRP. Second, the Volt should’ve/could’ve been Malibu sized and comfortably seat 5. Third, as you mentioned, they could bring a lower priced edition out with less battery/range, and less frills. I don’t think these suggestions are difficult or unreasonable. Not sure why you are attempting to put both CMAXs together. They are diff tech. The CMAX hybrid compares to a Prius. The CMAX Energi plugin compares to a Volt (although it is like a BEV for the 1st ~38 even with hard acceleration the car still runs in electric mode – hence EREV). Cruze sold more than all the Prius family !!! People say it is cost that held the Volt back but all the plug-ins sure seem to close close to $40k. Hmm. The Volt is hitting it’s stride. Politics clearly played a role in Volt sales – as you post proves as well. CMax Energi compares more to a Prius Plug-in than a Volt. Both CMax and Pip can run their engines during the EV portion of discharge (CD-mode). Volt doesn’t have to except for these cold winter days. Politics may have played a part on the Volt’s sales, but if that’s the case the pro-Volt political camp may have driven sales UP…. Remember there are 2 sides to politics. Bonaire – indeed with Volt way ahead in EV miles range and BEV like 1st X miles you are 100% correct. I was referring to 2012. So you want them to put in a smaller battery that might be $4000 cheaper (ignoring the R&D costs), then sell it for about $10,000 less? Got my 2011 Volt for $25K after rebates – new. It was purchased in July 2012. Bought the prior year, used GM Card earnings + bonus earnings and used the PA Rebate program. I’m sure others can duplicate this maneuver. So, may be Model S is the largest selling plugin in Jan ? So, why don’t they not publish their numbers ! One of the last marks of being a true auto maker…monthly sales and production. They’re not an Auto maker – they’re an automotive experience enabler. Few places record sales as thoroughly and as quickly as in the USA. Some countries you have to go by registrations. Canada is roughly the same as the US, but not as quick overall. How about adding a right column to your chart that has the total sales for the month? That would make it easier to tell 1) if the general trend is up or down and 2) whether one model is stealing sales from another. Thanks. Do you mean on our monthly scorecard tab page at the top of the site? I don’t know how to post pics here, but maybe he’s talking about something like this. I’ve thought about that, but the Tesla, Fisker, CODAs of the world make it very imprecise. We probably come in at 4,300ish this month (when Ford finally graces us with their numbers), but its more like 5,500-6,000 when the non-reporters (mostly Tesla) come in. I guess there could be an off-shoot/side column estimating their numbers, and the monthly net. IDK…maybe that is better then nothing at all? Is the iMiev number correct? I mean, going up to 257 in January from the paltry numbers like 30 or 40 all year? Is there any story behind the surge (a big fleet sale, perhaps?) or is it really just these cheap lease rates? It is, and looks to strictly be a product of heavy discounting. The question of course is this discounting a pre-amble to lowering the MSRP and trying to get as much out of this last generation of the EV as they can for a few years, or the beginning of the end starting now.